On the night of September 14 the largest program in the Sloan Digital Sky Survey-III, the Baryon Oscillation Spectroscopic Survey (BOSS) achieved 'first light' with an upgraded spectrographic system across the entire focal plane of the Sloan Foundation 2.5-meter telescope at Apache Point Observatory in New Mexico. BOSS is the most ambitious attempt yet to map the expansion history of the Universe using the technique known as baryon acoustic oscillation (BAO). It is the largest of four surveys in SDSS-III, with 160 participants from among SDSS-III’s 350 scientists and 42 institutions. “Baryon” (meaning protons and neutrons and other relatively massive particles) is shorthand for ordinary matter. For almost the first 400,000 years, the universe was so dense that particles of matter were thoroughly entangled with particles of light (photons), the whole a vast, quivering, liquid-like blob where density variations caused sound waves (pressure waves) to move spherically outward at over half the speed of light. Suddenly the expanding universe cooled enough for light and matter to “decouple.” Photons shot through transparent space unimpeded; the speed of sound plummeted. What had been variations in the density of the liquid universe left two marks in the now-transparent sky. Variations in the temperature of the radiation that filled the early universe have descended to us as anisotropies in the cosmic microwave background (CMB). Variations in the density of matter persist in the clustering of galaxies, as baryon acoustic oscillations (BAO). 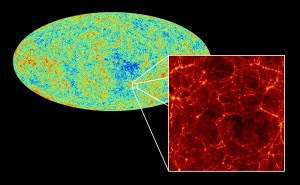 The two scales, the roughly one-degree anisotropy of the CMB and the 500-million-light-year clustering of BAO, are closely related; the standard ruler of the universe measured from BAO can be calculated from the CMB for any epoch since decoupling. 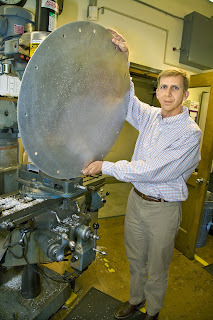 Schlegel and his colleague Nikhil Padmanabhan, who came to Berkeley Lab from Princeton in late 2006, first used the SDSS telescope to complete the largest three-dimensional map of the universe ever made until then: 8,000 square degrees of sky out to a distance of 5.6 billion light years, determining the clustering of 60,000 luminous red galaxies. This program, part of SDSS-II, measured galactic distances to a redshift of z = 0.35 and detected the 500-million-light-year scale of BAO. Baryon oscillations began as pressure waves propagated through the hot plasma of the early universe, creating regions of varying density that can be read today as temperature variations in the cosmic microwave background. The same density variations left their mark as the Universe evolved, in the periodic clustering of visible matter in galaxies, quasars, and intergalactic gas, as well as in the clumping of invisible dark matter. Comparing these scales at different eras makes it possible to trace the details of how the Universe has expanded throughout its history – information that can be used to distinguish among competing theories of dark energy. BOSS will measure 1.4 million luminous red galaxies at redshifts up to 0.7 (when the Universe was roughly seven billion years old) and 160,000 quasars at redshifts between 2.0 and 3.0 (when the Universe was only about three billion years old). BOSS will also measure variations in the density of hydrogen gas between the galaxies. The observation program will take five years. 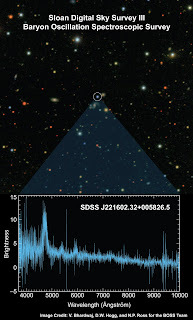 Existing SDSS spectrographs were upgraded to include new red cameras more sensitive to the red portion of the spectrum, featuring CCDs designed and fabricated at Berkeley Lab, with much higher efficiency than standard astronomical CCDs in the near infrared. “Visible light emitted by distant galaxies arrives at Earth redshifted into the near-infrared, so the improved sensitivity of these CCDs allows us to look much further back in time,” says BOSS instrument scientist Natalie Roe. To make these measurements BOSS will craft two thousand metal plates to fit the telescope’s focal plane, plotting the precise locations of two million objects across the northern sky. 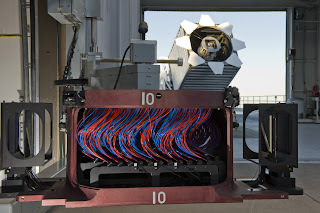 Each morning astronomers begin plugging optical fibers into a thousand tiny holes in each of the “plug plates” to carry the light from each specific target object to an array of spectrographs. With a thousand holes in each plug plate, stopping to seek out specific holes to plug a fiber into, or tracing where each fiber ends up, would take an impossibly long time. Instead a computer assigns the correct target identity to each fiber as a fiber-mapping laser beam moves over the plugged-in fibers and records where the light from each emerges. Now BOSS is on its way to generating data of unprecedented precision on two million galaxies and quasars, and density variations in the intergalactic gas. The SDSS tradition of releasing data to the public will continue, with the first release from SDSS-III planned for December 2010. "BOSS: The Baryon Oscillation Spectroscopic Survey", Nikhil Padmanabhan, David Schlegel, Natalie Roe, Martin White, Daniel Eisenstein and David Weinberg (a white paper describing the BOSS experiment). "Baryon Acoustic Oscillations (BAO) at LBNL", David Schlegel (a presentation at Lawrence Berkeley National Laboratory Physics Division Review, Nov 2006). The Sloan Digital Sky Survey III homepage.